Is The Times’ Paywall Already Bad News? The Times, based in the U.K. and owned by Rupert Murdoch’s News Corp., has begun rolling out its paywall. Eventually, readers will have to pay a subscription fee in order to read the newspaper’s online content, but for now, they only have to register for a free account and login. Even the free registration process has caused a significant drop in traffic, according to research by traffic metrics firm Hitwise. In fact, Hitwise says that The Times traffic has dropped to almost 50 percent of what it was prior to the required registration, which was instituted earlier this month. According to Hitwise numbers, none of The Times’ competitors, such as The Telegraph or The Guardian, are seeing a traffic increase as a result. The Telegraph is the next most popular destination, however. Robin Goad, Research Director at Hitwise, said, “Since it forced users to register in order to view its content, the Times has lost market share. However, this decline has clearly not been catastrophic and none of the paper’s rivals has particularly benefitted.” The Times has begun offering freebies, such as movie tickets and access to other events, and discounted products to entice readers to become paid subscribers. I have absolutely no problem with the decision to start charging. They can do what they like. But I didn’t start this blog for it to be the exclusive preserve of a limited few subscribers. I wrote it to entertain whosoever wishes to read it. Another blogger, known as Guido Fawkes, has thrown down the gauntlet, claiming that within 12 months he will have more measurable readers than any political columnist hidden behind The Times’ paywall. 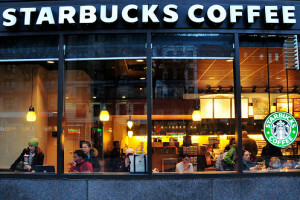 In related news, Starbucks will soon offer free wi-fi Internet access in its coffee shops, including free and unlimited access to various paid sites and services such as The Wall Street Journal and The New York Times. The latter has not instituted its paywall yet, but plans to by next year.